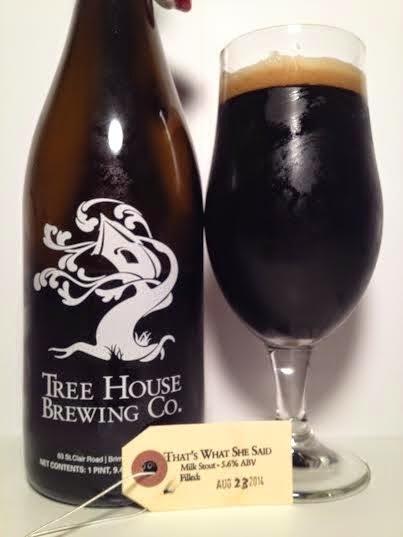 Our last trip to Tree House this week ends with "That's What She Said" a 5.60% milk stout. After having the Double Shot earlier this week, I'm curious to see how a lighter, sweet stout holds up against it. Pours nearly pitch black, maybe an extremely dark brown. It gave off a considerable, khaki head that nearly spilled over the top of my glass. A huge roasty aroma greets you on the nose. Following that is a light milk chocolate and lactose. I wouldn't necessarily call the first sip akin to roasted coffee. Instead, it's more smokey than roasty. It's pretty flavorful for the style with hints of chocolate and dark roast coffee. The lactose gives it a smooth mouthfeel and takes away a lot of the bitterness of most beers associated with the style. At 5.60%, it drinks bigger than it should be, but remains an easy-drinking experience. Most milk stouts tend to be watered down with an unpleasant lactose sugar aftertaste, but That's What She Said has emerged as one of the best of the style. It's surprisingly robust for a milk stout and thanks to it's 5.60% abv, it remains drinkable while containing plenty of tongue-pleasing, cofee and chocolate flavors.